As the 2nd innauguration of President Barack Obama is about to take place in Washington, DC, THE MAN is going to Baltimore, MD for a FREE screening and discussion led by Clayton LeBouef. The script, written by Rod Serling (best known as the creator of the classic television series “The Twilight Zone”) is based on the novel of the same name by Irving Wallace, and directed by Joseph Sargent (“Something the Lord Made,” “Warm Springs,” “Taking of Pelham One Two Three”). The film was intended to debut as a television movie, but received a short theatrical release in 1972 with an opening run at Baltimore’s Charles Theater. A few months ago, I described the efforts to preserve the 1972 film “The Man” as a “Peoples Preservation Campaign“. The work of preservation is born of knowledge, technical skills, and a passionate appreciation for essential truths, events and innovations in our material culture. Preservationists are more than just history detectives. But what makes a “Peoples Preservation Campaign” different from what some associate with traditional preservation? This weekend (June 17 at 1 PM), LakeArts Foundation in Chautauqua, New York will feature “The Man” as part their film festival series “Politics Goes to the Movies.” “Milk,” “All the King’s Men,” and “The Chautauqua Choice” (a local favorite), round out the thematic schedule. The festival, now in its 3rd year, is the creation of Bonnie Nelson Schwartz and Margaret Johnson. Clayton LeBouef, who is partnering with eclectique916.com to present “The Man” and other events will be one of the featured speakers after the film. The Rod Serling Memorial Foundation is also participating in the event. 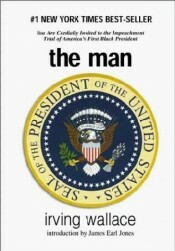 “The Man” has been restored in terms of public programming. Restored in the sense of presenting [the film] in public venues where people can see it. Otherwise, it would still be lost. As this story builds, we are changing a way of thinking about “preservation.” We are not restricted to “the vault,” the lab or even the institution. At least that’s my definition of a “peoples preservation campaign.” Even word-of-mouth — if people are talking about Serling and “The Man” – that’s preservation. This is not being badass with institutions, the film industry, or preservation. We have licensed “The Man” for public viewing from the copyright holder, Disney. 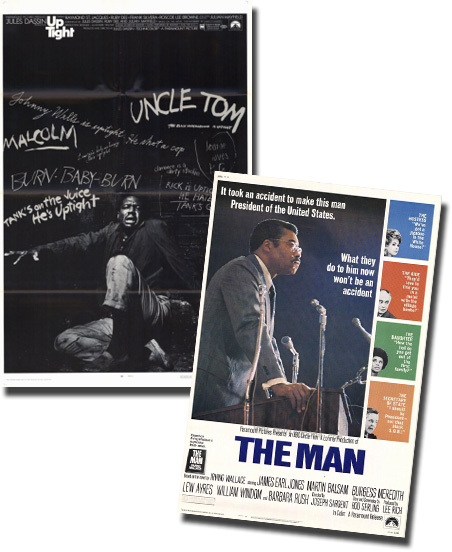 “The Man” was a production of ABC and Lorimar with ABC as the official copyright holder. ABC merged with Cap Cities and was acquired by the Walt Disney Company in 1995. We’ve taken “The Man” to Busboys and Poets, a multi-purpose gathering space for food, drink, arts, and thought. Institutions like National Geographic, LakeArts Foundation, and recently an inquiry from UCLA for an upcoming event on the work of Rod Serling (screenwriter for “The Man”) signals that the time has come to take a new look at the film. The Library of Congress holds a 16 mm copy of “The Man” and the original copyright card file for ABC. We’ve passed this information to Disney realizing it takes time and staffing to sort through company libraries and files from an acquisition. We all want to set the records straight. Clayton LeBouef is creating a list of “lost films.” This “Peoples Preservation Campaign” selects a work on the basis of its talent, story merit, and how the stories connect with hearts and minds, and reflect our on-going struggles and triumphs in our human relations. In other words the film’s ability to “make the people conscious.” But that’s the next step. More on the MTPC Project later. 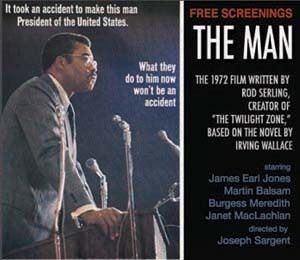 Don’t miss the final night for the free presentation of Rod Serling’s 1972 film “The Man,” Sunday, November 28 at 8 PM at Busboys and Poets (5th & K Streets, NW), part of the Focus In film series. 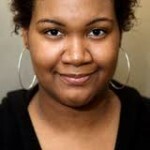 Latoya Peterson, owner and editor of Racialicious, a blog that keeps tabs on the intersection of race and culture joins Clayton LeBouef for the Q&A following the film. The film is FREE and open to the public. Dinner service will be available.